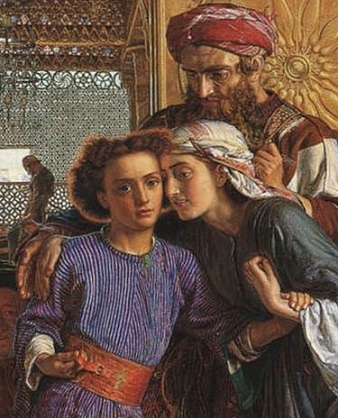 William Holman Hunt (1827-1910) began his artistic career in London, studying alongside Dante Gabriel Rosetti, Ford Maddox Brown and John Everett Millais. Together they formed the Pre-Raphaelite brotherhood, that started off as a secret society dedicated to rejecting what they saw as the dead hand of classical formalism promoted by the Royal Academy. While Hunt had been an atheist or agnostic, he was converted through reading the Bible in 1851.As a result of his strong response to the Scriptures, he found himself more attracted to more evangelical rather than high church liturgy and spirituality. By 1853 he painted the iconic The Light of the World, one copy of which is now in Keble College, Oxford; the other in Saint Paul’s Cathedral in London. Determining on a “single-minded application of [his] art to the service of Christ,” he desired to depict biblical scenes as faithfully as possible, going so far as to travel to the Holy Land in 1854 to capture the atmosphere and local color more accurately. Later that year he began work on The Finding of the Saviour in the Temple, his masterpiece. He was not to finish it for almost six years, making of his painting an extended form of meditation on the biblical text. 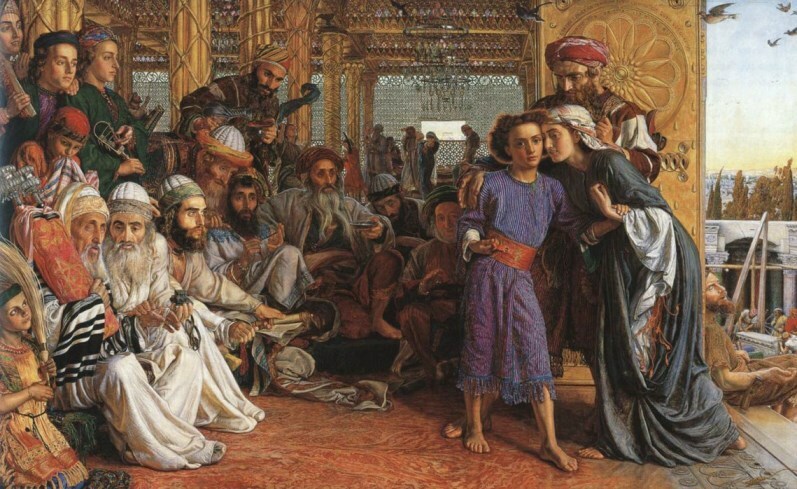 This painting, visually focused on the twelve-year-old boy Jesus, highlights a moment in Saint Luke’s narrative which is not elsewhere recorded in the Bible. Hunt depicts it with a tapestry of typological clues and symbolic elements in such a way as to deepen the rich christological significance of Luke’s narrative. While the viewer’s eyes are naturally turned on the face of Jesus, apparently absorbed in thought, the maternal embrace of Mary, whispering rather than rebuking him aloud, captures a tender yet tense familial moment. Emotions are registered also on the faces of the elders, who are represented by Hunt in such a way as to display a variety of responses. These are not the faces of wonderment and suspended judgment that one finds in Giotto’s version of the scene (which more clearly reflects the elders’ astonishment —Luke 2:47), but rather express self-conscious, hardened attitudes designed to make the elders in this episode proxy to the Pharisees and Sadducees who will later contest Jesus in his ministry. One of the elders is blind, like the blind beggar leaning against the outside corner (Luke 6:39–40; cf. John 9:1–11). Inside, in the background, a lamb is being prepared for slaughter, while outside we can see that a cornerstone for some edifice is being set and it is receiving the scrutiny of the builders (cf. Matt. 21:42). A part of Malachi’s prophecy, “And the Lord, whom ye see, shall suddenly come to the temple” (Mal. 3:1) is inscribed in Latin and Hebrew on the golden frame of the temple door. As is typical of Hunt, the iconography is self-consciously organized, here so as to show that the traditional place of the holy, the temple, was in the fullness of time entered bodily by the one who alone is holy, and that neither the elders nor Mary and Joseph really understood that most crucial fact at the time. The texture, colour and finish of the canvas compose a dazzling beauty. The painting has a jewel-like luminescence. Hunt’s search for a locus for the holy had taken him in a different direction than his fellow Pre-Raphaelite Brotherhood colleagues, one in which the canonical Scriptures rather than Marian or Arthurian legenda hold the interpretative key. His distinctive artistic achievement makes him not only the most eminent evangelical painter of his era, but shows him to be an artist-theologian, a spiritually discerning interpreter of the Bible he loved. David Lyle Jeffrey, FRSC, is Distinguished Professor of Literature and the Humanities at Baylor University, as well as Guest Professor at Peking University and Professor Emeritus at the University of Ottawa. His most recent book is In the Beauty of Holiness: Art and the Bible in Western Culture (Eerdmans, 2017).